I continue the series of beautifully written articles about the Norway events. The next one was written by Norwegian author and musician, Jo Nesbø, for The New York Times. A FEW days ago, before the bombing here and the shootings on Utoya Island, a friend and I were talking about how the joy of being alive always seems to go hand in hand with the sorrow that things change. Not even the brightest future can make up for the fact that no roads lead back to what came before — to the innocence of childhood or the first time we fell in love. There is no road back to the scent of the Julys when I was young and leapt from a boulder into the ice-cold meltwater of a Norwegian fjord. No road back to when I stood, 17 years old with 10 francs in my pocket, by the harbor in Cannes, France, and watched two grown men in idiotic white uniforms row a woman and her poodle ashore from a yacht. I realized then for the first time that the egalitarian society I came from was the exception and not the rule. No road back to the first time I looked, wide-eyed, at the guards with automatic weapons surrounding another country’s parliament building — a sight that made me shake my head with a mixture of resignation and self-satisfaction, thinking, we don’t need that sort of thing where I come from. For many years, it seemed as if nothing changed in Norway. You could leave the country for three months, travel the world, through coups d’état, assassinations, famines, massacres and tsunamis, and come home to find that the only new thing in the newspapers was the crossword puzzle. It was a country where everyone’s material needs were provided for. Political consensus was overwhelming, the debates focused primarily on how to achieve the goals that everyone had already agreed on. Ideological disagreements arose only when the reality of the rest of the world began to encroach, when a nation that until the 1970s had consisted largely of people of the same ethnic and cultural background had to decide whether its new citizens should be allowed to wear the hijab and build mosques. Still, until Friday, we thought of our country as a virgin — unsullied by the ills of society. An exaggeration, of course. And yet. The prime minister wearing his bike helmet; the boy wearing his seat belt; both of them stopped for a red light. The bodyguards had stopped a discreet distance behind. Smiling. It’s an image of safety and mutual trust. Of the ordinary, idyllic society that we all took for granted. How could anything go wrong? We had bike helmets and seat belts, and we were obeying the traffic rules. Of course something could go wrong. Something can always go wrong. On Monday night, more than 100,000 citizens gathered in the streets to mourn the victims of the attack. The image was striking. In Norway, “keeping a cool head” is a national virtue, but “keeping a warm heart” is not. Even for those of us who have an automatic aversion to national self-glorification, flags, grandiose words and large and expressive crowds, it makes an indelible impression when people demonstrate that they do mean something, these ideas and values of the society we have inherited and more or less take for granted. 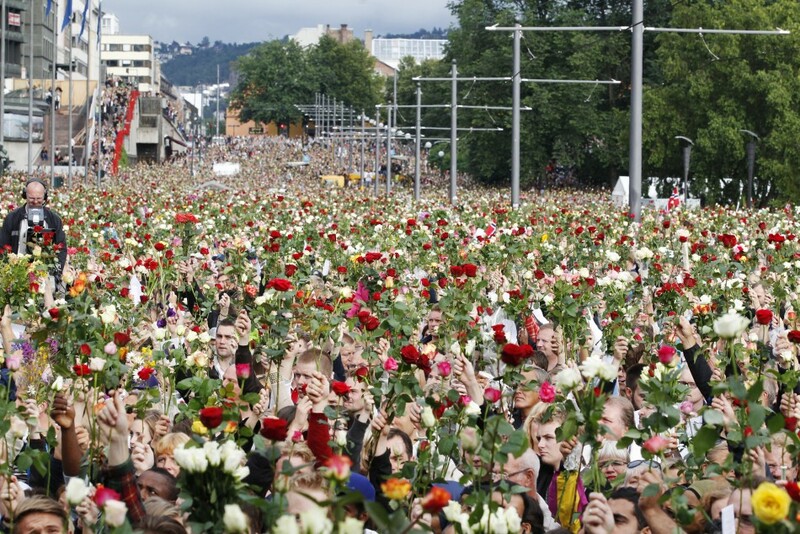 The gathering said that Norwegians refuse to let anyone take away our sense of security and trust. That we refuse to lose this battle against fear. And yet there is no road back to the way it was before. Yesterday, on the train, I heard a man shouting in fury. Before Friday, my automatic response would have been to turn around, maybe even move a little closer. After all, this could be an interesting disagreement that might entice me to take one side or the other. But now my automatic reaction was to look at my 11-year-old daughter to see whether she was safe, to look for an escape route in case the man was dangerous. I would like to believe that this new response will become tempered over time. But I already know that it will never disappear entirely. So if there is no road back to how things used to be, to the naïve fearlessness of what was untouched, there is a road forward. To be brave. To keep on as before. To turn the other cheek as we ask: “Is that all you’ve got?” To refuse to let fear change the way we build our society. Jo Nesbo is the author of the novel “The Snowman.” This article was translated from the Norwegian by Tiina Nunnally.